Lazar Stefanovic is a Project Associate at MDRI-S in Belgrade. He is involved in various tasks such as report writing, legal analysis, qualitative research etc. He specializes in international normative and theoretical frameworks of deinstitutionalization of persons with mental disabilities. Lazar is currently participating in the UN Global Study on children deprived of liberty on the invitation of leading expert professor Dr. Manfred Nowak since February 2017. For the purpose of this study he is collecting data on children who are residents of social and health care institutions in Serbia, where they are virtually deprived of their liberty. Lazar previously worked for the Hungarian Civil Liberties Union, a Budapest-based NGO, where he conducted research on deinstitutionalization of children and adults in five countries of central and south-eastern Europe: Czech Republic, Slovakia, Poland, Romania and Bulgaria. The outcome was a 50-page long internal report on the current state of deinstitutionalization in the aforementioned EU members. In 2017 Lazar graduated from the programme European Master of Arts in Human Rights and Democratization in Venice, Italy. During his master’s studies, after a semester spent in Venice, Lazar lived in Budapest and was enrolled at Eotvos Lorand University and Central European University where he conducted research and wrote a master’s thesis on the phenomenon of institutionalization and the related current issues in the Balkans, titled: Are Four Centuries of Systemic Segregation Coming to an End? A socio-historical analysis of custodial care with case studies on deinstitutionalization of children with disabilities in Bulgaria and Serbia. Lazar studied criminalistics and police studies before he enrolled at a faculty of law in Novi Sad, Serbia where he earned a Dipl.jur. degree in 2016. 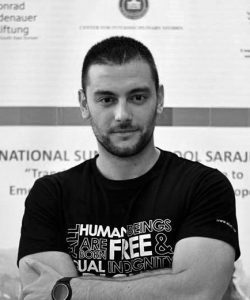 He also holds a certificate from Belgrade School of Human Rights “Vojin Dimitrijevic”, Serbia’s most notable human rights oriented educational establishment.